The Sternberg Palace on Hradčanské Square is one of the most significant works of the High Baroque in Bohemia. 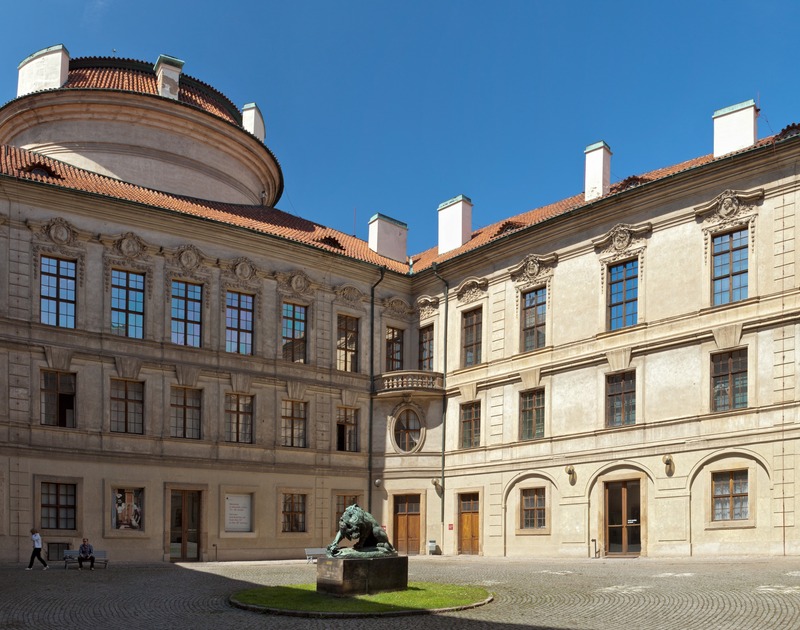 Today the building is under the administration of the National Gallery Prague, which has placed its collections here. The permanent exhibition was installed after the original ceilings were exposed and renewed. The best works from the national collection, dating from ancient Rome to the end of the Baroque, are displayed on several floors of the palace. Free entry to all six permanent exhibitions of the National Gallery in Prague is ensured to children and students younger 26 years. It is valid for a single entry to every permanent exhibition of the National Gallery in Prague for 10 days after having been purchased. In the vicinity of Prague Castle, there are many beautiful palaces. All the noblemen tried to build their seat near the Castle, which gave rise to the unique square Hradčanské náměstí, for example, where there is no burgess house, only exhibitory palaces. To the side above the Deer Moat, there is an urban garden palace, built after 1698 by Václav Vojtěch of Šternberk. This building is one of the most significant pieces of secular architecture of the beginning high-Baroque in our territory. The author of the project is not exactly known; Vienna original project’s architect was supposedly Domenico Martinelli, and Giovanni Battista Alliprandi and Jan Blažej Santini are most commonly quoted as the authors of the newly realized project, although some sources name Kryštof Dienzenhofer and perhaps even Johann Bernhard Fischer of Erlach might be considered. The significant object was built in place of an older Gothic and Renaissance development, where the Renaissance palace owned by Kryštof Popel of Lobkowicz used to be at the end of the 16th century. The two-storied palace has four wings grouped around a nearly square yard with a cylindrical front, protruding into the small garden by the palace’s Western side. The round front’s height overtops the roof of the palace wing. The entrance to the building is formed by a passage way, which copies a part of the old road between Hradčanské náměstí and the Deer Moat, and which is ended by an oval vestibule. From here, a monumental four-flight staircase can be ascended, which passes through all the storeys. A new element from French architecture was used here during the construction - a picturesque mansard roof. The interior facades of the four wings facing the yard are rich in decorations. The second-storey windows are decorated with medallions with heads of the Roman imperators, and with relief displays of the Heracles legends (fights with the Cretan Bull, the Lernaean Hydra, the Nemean Lion and the Giant Antee). Since 1947, there has been a monumental bronze statue of a Lion crushing a boa snake in the middle of the court yard, made by Antoin-Louis Bary from France. The Southern wing remained unfinished in the Baroque era. It was only completed in the years 1835 - 1842 by Jan Novotný. It was then that the new-Baroque entrance front was made. As a part of the completion work, a large hall on the second floor of this wing was also created. 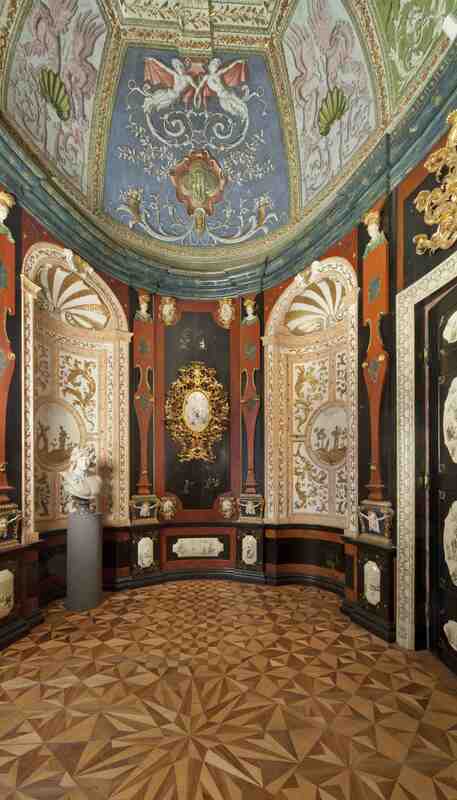 The interior decorations correspond to the excellent architecture of the palace. The stuccos in the second-storey halls were realized by Giuseppe Donato Frisoni, oval mirrors on the ceilings of the two halls were filled by paintings of Michael Václav Halwax, depicting a suicide of the Carthaginian queen and a mourning queen of Halicarnassus, adding the ashes of Mausolus, her deceased husband, into her goblet. In the neighbouring hall, there is a painting with mythological encomiastic scene, perhaps by Matěj Nettel. The ceilings of the Chinese and the Antique cabinets were painted by Jan Rudolf Byss with allegories celebrating the Šternberk coat of arms. The oval Chinese lounge was decorated with chinoiseries of Jan Václav Kratochvíl, precious pieces of art on the walls are realized in relief gold on a lacquered base. On the first floor of the building, there used to be paintings with planets, continents and portraits of prominent personalities, such as Christopher Columbus; these paintings are covered nowadays. 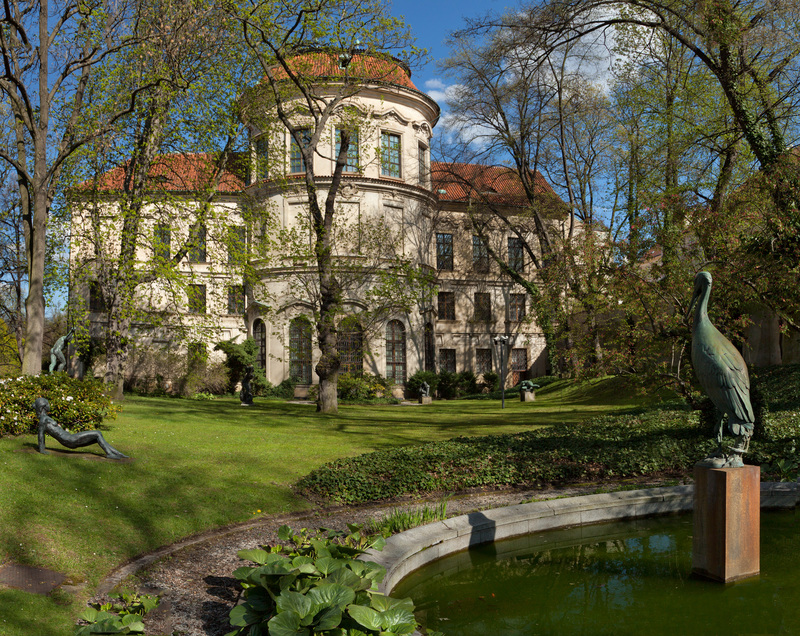 One of the heirs sold the palace in 1811 to the Society of patriotic art lovers, who moved the recently established picture gallery here from the Černín Palace, changed into a military hospital. From 1821 to 1847, the palace was hired by the National Museum. Back then, the pioneers of Czech science, such as Pavel Josef Šafařík or a botanist Karel B. Presl used to work here, and an archivist Václav Hanka even lived here for a time, just like a painter Antonín Mánes. The Šternberk Palace was then too far from the city centre and was not suitable for public collections, and the Society of patriotic art lovers sold it in 1871. A year later, the St. Anna Association of Ladies and Girls established a shelter for the feeble-minded here, which was named Ernestinum in honour of the chairwoman and the benefactress Ernestina Auersperková. When the institution moved out from Prague in 1918, an intendant military school was established in the palace, the government army had its seat here during the protectorate, and the Castle Guard had its barracks here from 1945. In 1946 - 1948, the building was adapted for the National Gallery collections, the first exposition of which was soon installed here.